The Cuban Liberty and Democratic Solidarity (Libertad) Act (Helms-Burton Act) is the latest appendage to the Cuban embargo. Title III has caused an international uproar because it gives U.S. victims of Cuban expropriation a right of action within U.S. courts against third parties who traffic in confiscated property. For example, a U.S. citizen can sue a Canadian Mining company doing business in Cuba if they are operating on or using expropriated property. The Helms-Burton Act (HBA) targets U.S. allies who continue to trade and invest in Cuba regardless of pending U.S. claims of expropriation. In response to the HBA, Cuba, Canada, Mexico, and the European Union (EU) created antidote legislation to protect their domestic interests against the allegedly illegitimate extension of U.S. jurisdiction. This Article investigates the interesting relationship between the economic and political power of a country and its ability to curtail the domestic effects of the HBA. Part II provides a brief background of the HBA and evaluates the virtues and vices of each of its four titles. Part III argues that the United States is using Title III as a bargaining device to force U.S. allies to adjust their policy towards Cuba and to discourage foreign corporations from investing in the island. Given the United State's acutely unequal level of political and economic power in the world, the mere threat to enforce Title III has had severe implications for Cuba and its trading partners. Part IV presents the legislative offensive launched by Cuba, Canada, Mexico, and the EU to protect their domestic interests in the face of this Title III threat. More importantly, this section explores how power asymmetries limit the ability of foreign governments to block the application of U.S. law within its jurisdiction. Part V explores the utility and efficacy of using antidote legislation as a diplomatic tool. 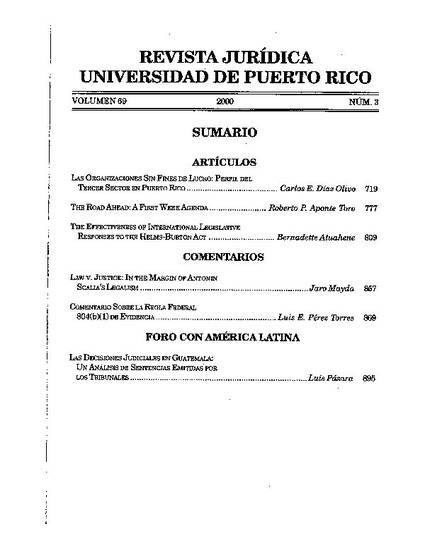 The Effectiveness of International Legislative Responses to the Helms-Burton Act, 69 Revista Juridica Universidad de Puerto Rico 809 (2000).